This article describes how you can get access to your modusGate or sign up for your 30-day free trial license for Azure BYOL (Bring Your Own License) . 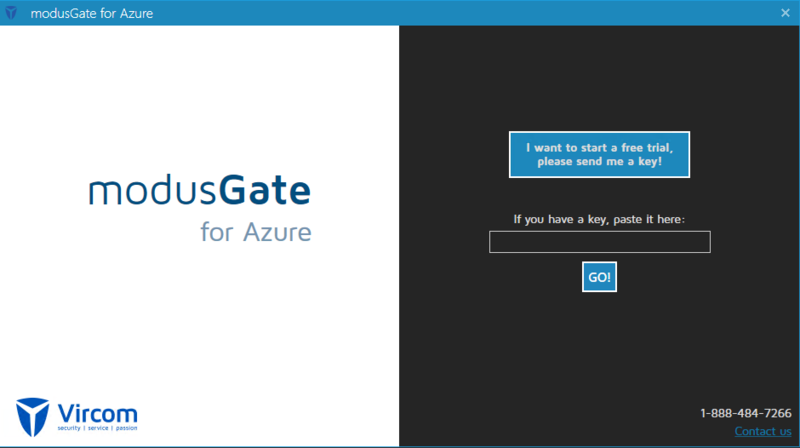 Note: If you’ve not deployed modusGate from the Azure MarketPlace go to this KB page: deploying modusGate on Azure. 1. Log into your MS Azure Portal. 2. Select the VM from the MS Azure Dashboard. 3. Simply select the “Connect” button from your Azure Portal. 4. Login to your VM via the RDP client. 5. Once logged into the VM you wil be prompted with a "modusGate for Azure" onboarding application. 6. There are two options that can be used to start using modusGate. 1. Select “I want to start a free trial, please send me a key!”. Complete a simple sign-up form and we will email you a free 30-day trial license. 2. If you already have a modusGate ASV-AB key, then you can simply copy and paste it in the text box. 7. Copy and paste a Key in the text filed and seledt the "GO" button and modusGate will be initialized and ready to be used. Next Step: How to configure a Route in modusGate.